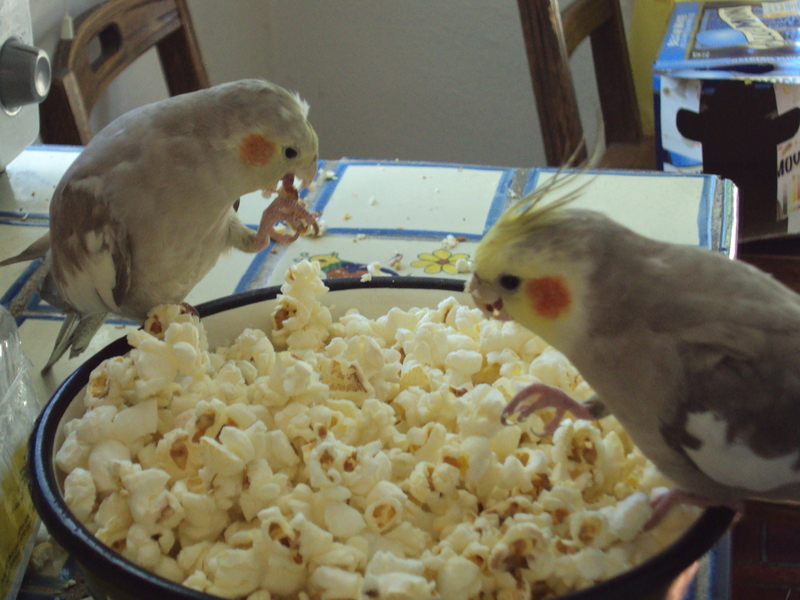 Two cockatiels enjoy plain popcorn -- a favorite treat! I’ve mentioned already that my cockatiels Sokka and Boo love millet as a treat. Well, I forgot to mention that they also love popcorn! Plain stove-topped popcorn makes for a great treat! The popped kernels are the perfect size for young cockatiels to pick up and hold with their feet while munching on bite-sized bits. This cheap and human-friendly snack is also easy to introduce, as I have yet to hear of a cockatiel that doesn’t take to it. Just make sure the little birds stick with the plain stuff — salt and butter are not healthy for ‘tiels. Boo and her brother Sokka are quickly learning to tell when I’m popping popcorn. They get very excited and call to be let out the entire time the kernels heat up. Once I place the popcorn in a bowl and let them out, these two fly over and begin to dig in. I can only imagine what an enormous bowl of tasty popcorn must look like to these guys. Their enthusiasm is very apparent as they joyfully eat and make a mess of everything! One dated myth concerning cockatiels is that they don’t use their feet much to play or eat. As you can see, this isn’t the case. Sokka and Boo are surprisingly deft with their feet, manipulating the kernel while they take bites. After a few minutes, I take a small handful of popcorn and use it for foraging. The popped kernels are perfect for hiding in finger-traps or wrapping in cupcake holders. For the next hour or so back in the cage, the two ‘tiels busy themselves with finding every tasty morsel hidden throughout their cage. This is a fun weekend activity for them, and they are blissfully quiet all afternoon, taking a full-bellied nap after they finish eating and foraging. on October 30, 2011 at 6:55 am | Reply Patti S.
I love this blog, great picture of the tiels eatting popcorn!